The Millennials: Continuing a family’s entrepreneurial spirit. Editor’s Note: Sustaining a community and keeping it vibrant requires diversity on many levels, especially among age groups. An unintended movement the last few years has been the increased number of millennials who have taken a role in community and business leadership in Mason County. A millennial, also known as Generation Y, is defined as a person who was born from the early ‘80s to the 2000s.. This generation grew up in the digital age and often offers a unique and fresh perspective to leadership. This is the ninth story in our series on the area’s millennials who are making an impact in our community. Sponsored by All Access Care of Ludington. Located at 329 N. Jebavy Dr. in Ludington; 231-425-4544;www.all-access-care.com. By Kate Krieger. Senior Correspondent. LUDINGTON – Finally landing what she thought was possibly her dream job, Fountain native, Noelle Andrulis-Welch, 35, left it all to return home to become her own boss. Graduating from Mason County Eastern in 1997, Noelle had always known what it was like to own a business. Her grandparents moved to the states from Lithuania and started Andrulis Cheese in the 1940s. Noelle worked at the cheese factory since she was very young and even when friends came over, she still had to help out, so her friends ended up helping as well. She knew she didn’t want to work at the factory for a career and she had always been interested in doing hair, but her parents pushed her to attend college. During her college experience, Noelle studied abroad in London for four months and got some great opportunities doing fashion show productions, where she coordinated everything that goes into producing fashion shows. She graduated from Western in 2002 and then moved to Chicago, where she worked designing furniture. During a summer while living in Chicago, she returned home for a visit during Gus Macker weekend. While watching a game with friends at Gus Macker, her friend Lynda Matson introduced her to Rich Welch and, to make a long story short, Noelle and Rich started dating and were married in 2004. After the couple started dating, Noelle moved to Canton where she attended cosmetology school and Rich was a police officer for Wayne State University. The couple stayed there for a short time and then relocated to Grand Rapids, where Noelle got a job at a salon. Working for Loreal, Noelle was in charge of the Midwest territory and she stated that she went into salons that carried Loreal products and she educated staff about new product lines. Thinking that she had finally landed her dream job with Loreal, Noelle’s mother passed away unexpectedly in 2010, so along with Rich, she packed up her life, quit her job and moved back to Mason County. The change in ownership was well accepted by old clients and new. 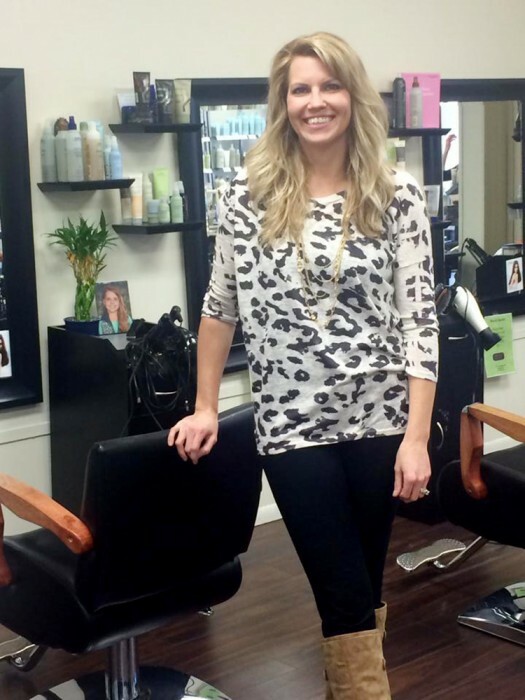 Noelle has been very pleased with owning Salon 22 in Ludington and she has been happy with her choice to move home and is excited to see what the future holds for her. Along with business ownership, being a mom and wife, Noelle also does a lot of volunteering for the American Cancer Society as a way to give back to something that has been very personal to her. Along with holding an annual caregiver’s event at the salon to give back to cancer caregivers in the area, Noelle also is involved with the American Cancer Society’s wig bank at Salon 22. She says Ronda had been involved with the wig bank and she just kept the service going and clients can come in to pick out a free wig donated by the Cancer Society and the salon will cut and style the wig to their own liking. New to her volunteering this year, Noelle was invited to be take part in Floracraft’s Life Blooms event. Noelle says she will be placing different color hair extensions in people’s hair to represent the colors each cancer support group has. Along with all her volunteering for the American Cancer Society, Noelle is also a SCORE mentor with the local Chamber of Commerce. Continuing to give back to the county that has supported her family through the years, Noelle doesn’t see herself slowing down anytime soon and she is very excited to see what else the future holds for her as a business owner and as a local volunteer.